In a fast-changing business and marketing worlds, it’s important to be flexible and agile when it comes to your strategic marketing plan. A one-page plan is a great visual marketing road map that is easy to change and helps keep your team’s eyes on the ball. Marketing is changing fast, and you have to change with the times. 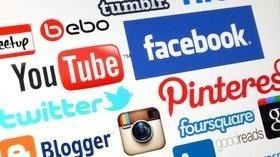 New social media platforms keep emerging (by the way, have you added Google+, Pinterest and Instagram to your B2B marketing plan? They work!). Google changed its algorithms to favor quality content in the form of long blog posts. Using quality visuals with your social media messages increases engagement. Undoubtedly, more change is coming. A one page plan allows you to view all your tactics in one place and see how they are interrelated. It includes the financial results, as well, including cost per lead and return on investment. If one marketing activity doesn’t yield results, reduce or eliminate it and do more of what is working! You can easily make additions or changes visible to your team. 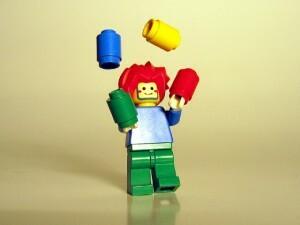 Social media marketing means there are lots of balls in the air. With multiple social media platforms on which you can market, and each one requiring different formats and messaging, there is even more for marketers to do today. Content marketing often requires a high volume of publishing to be effective. A one page plan brings all the channels together, allowing you to coordinate and manage everything that needs to get done from one place. Visual marketing project management is highly effective. 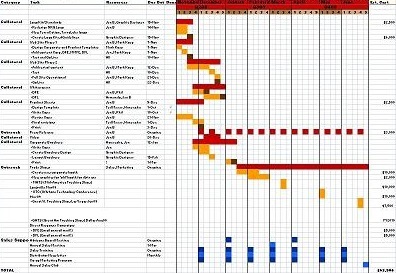 A one-page plan allows you to easily track who is responsible for what tasks to stay on top of project milestones and deadlines. Studies show that people work very well with visual management tools such as the one page marketing plan. They don’t have to read text and try to interpret what they need to do. They can just check the plan regularly to get their marching orders. There are other visuals you can use with your marketing, too. Some people are creating mind maps (it’s not my thing, but do a Google search for “mindmap for marketing” and you’ll see some cool examples). 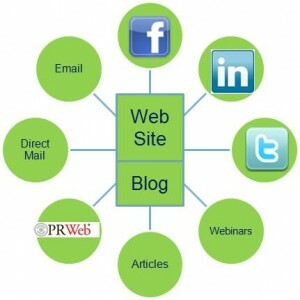 I use a diagram (originally developed by Hubspot) such as the one above to show clients how their use of social media and traditional marketing integrate to drive traffic to their website, the center or “hub” of their marketing system. Are you beginning your new planning cycle for successful marketing? Asking what worked and what didn’t work this year? Learning about new tactics that others use with proven results? It’s time, and the one-page marketing plan can help you accomplish your goals. To help you with your planning, we’ve developed a marketing plan template for you to use for your own marketing. Download our free one-page marketing plan template here. If you need help planning your marketing, contact New Incite today. Since 1997, we’ve helped hundreds of companies execute the right marketing activities to get the results they need. Flickr photos by Automotive Social Media and Markus Lütkemeyer. Some Rights Reserved.